A variety of dried herbs grown naturally in the Provence region of southern France that are combined to create a savory flavoring for foods such as fish, meats, olives, potatoes, stews, soups, and sauces. 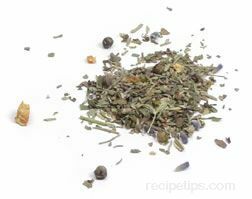 This blend of herbs is very versatile and goes well with many different foods. The herbs included are traditionally basil, fennel, lavender, marjoram or mint, rosemary, savory, sage, and thyme. Variations of this blend can include all, some, or additional herbs (such as bay leaf, peppercorns, orange peel, and tarragon), to make flavorful combinations referred to as herbes de Provence. The flavors provided by the traditional mix are: basil - a sweet and somewhat tangy taste; fennel- a strong anise flavor; lavender - a light bland flowery taste; marjoram or mint - a slight oregano flavor; rosemary - the aromatic spruce seasoning; sage - an earthy flavor; savory - a spicy or peppery hot taste; and thyme - a natural earthy seasoned flavor. They are also known as Provencal herbs. The mixture is generally spread over the foods when they are cooked or mixed with oils to be infused into the foods, such as herb flavored olives.